Click Here To Go To Learn More! 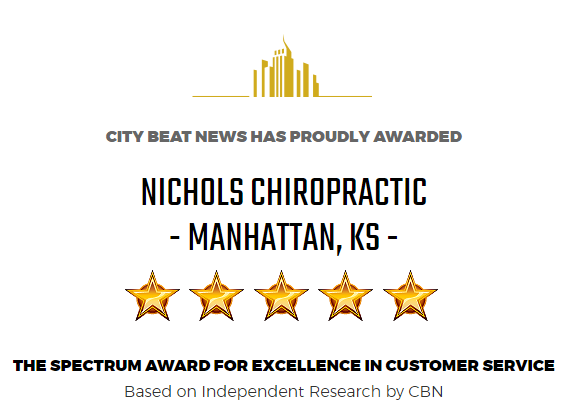 Nichols Chiropractic combines chiropractic with the latest manual therapy techniques and functional medicine to bring you better health and an enhanced quality of life. Through chiropractic care and rehabilitation treatments, our Manhattan chiropractor provides pain relief for back pain, neck pain, sciatica, headaches and migraines, car accident injury and sports injury. Pain management and healing are our goals. We strive to give you effective pain relief and help you heal quickly without the use of invasive procedures. Our clinic not only houses the most innovative equipment and technology in chiropractic care but also utilizes traditional acupuncture techniques to further enhance your healing potential. You will receive quality care from our chiropractors and staff who are genuinely concerned with your health and well-being. Our chiropractic services include manipulation therapy, instrument adjusting and advanced spinal correction utilizing the latest physical medicine techniques including iTracTM extension traction therapy, ART methods and Kinesio Tape protocols. Manual chiropractic adjustments assist in realignment of the spine which helps restore range of motion and mobility while boosting the immune and digestive systems to get your body functioning properly from the inside out. Chiropractic adjustments help alleviate musculoskeletal pain including back pain and neck pain that often results from a car accident injury or sports injury. Manual adjustments combined with acupuncture are effective for headaches and migraines. iTracTM Therapy is an advanced system used for restoring lost cervical curvature and correcting forward head posture. Our Manhattan chiropractor uses the modern technology of iTracTM extension traction therapy to treat headaches, migraines, neck pain and TMJ disorders. Since forward head posture increases stress and strain on your muscles, ligaments and discs in your neck, iTracTM Therapy effectively restores normal posture to your head and back, which in turn alleviates back pain, neck pain, headaches, migraines and TMJ disorders.